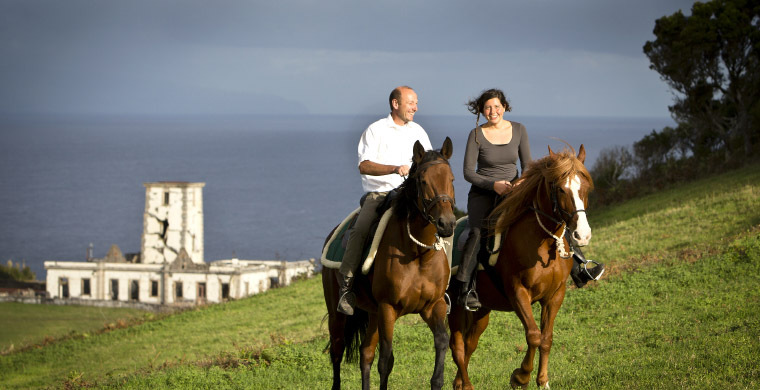 Faial, the Blue Island, unites the diverse natural landscape of the Atlantic archipelago like no other of the nine islands. 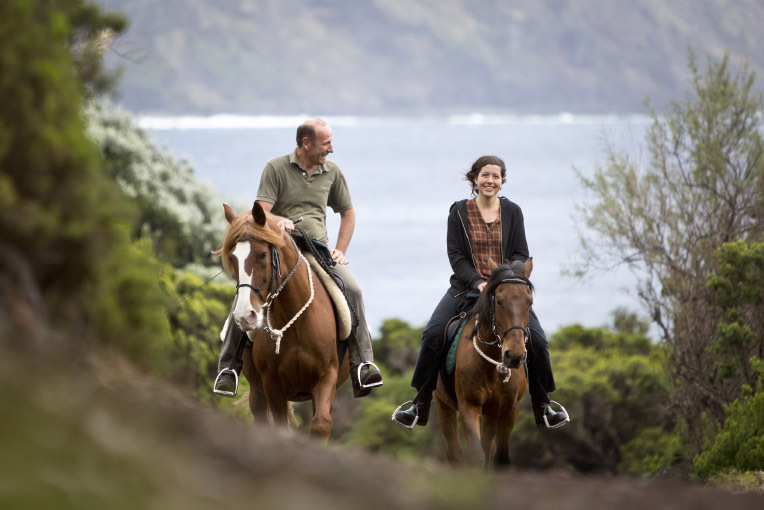 You will experience the volcanic origin on this individual riding and hiking tour. On the edge of wild-romantic volcano craters, through solitary valleys, along the steep coast and on path with breathtaking views. Discover with your horse and by foot this little piece of paradise. together with my partner on foot." 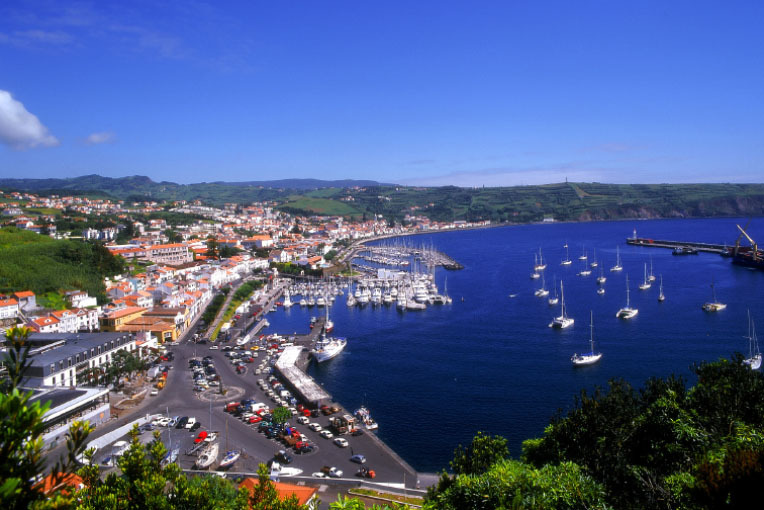 In the morning we drive to the west of Faial Island. In the middle of the forest one of the most beautiful hikes of the Azores begins along the small water channels of Levada. Narrow bridges and small tunnels always go along the watercourses. A dense magic forest with Japanese cedars. After a picnic, we return in the late afternoon to the lodge via meadows and fields. Dinner is waiting for us at PÁTIO Lodge. From our lodge we start today the ascent to the island volcano. We reach the viewpoint Piolio via old supply paths. Already now, the village of Cedros lies deep among us. We continue uphill. The path is lost in meadows. Through wild hydrangea hedges and small valleys leads us the barely recognisable path. Suddenly we reach the edge of the Caldeira. 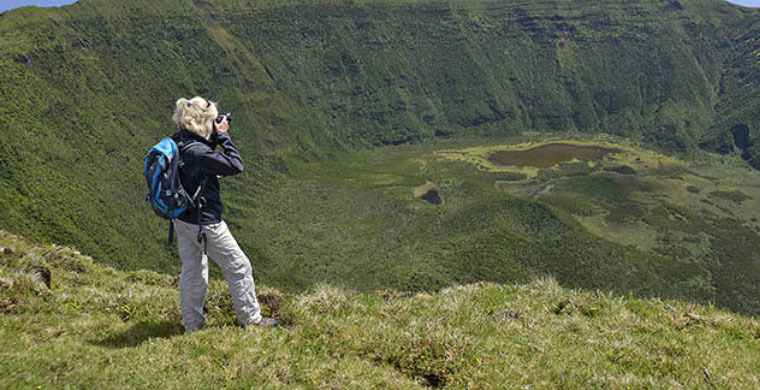 An impressive 400 m deep and 2500 m wide crater hole opens up indescribably impressive. Deep down its an own world. 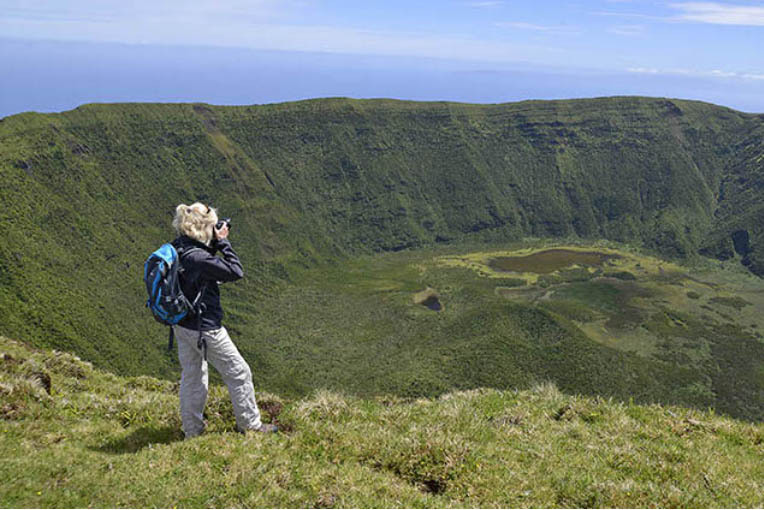 We begin the roundabout trail of the crater and after some time we reach the highest point of the island with 1043 meters. During our picnic we enjoy the great panoramic view. Slowly the circle closes around the crater and we reach the starting point of our circuit. Over meadows we return slowly back home. In the late afternoon we reach the lodge. In the morning we set off with our horses to the west. 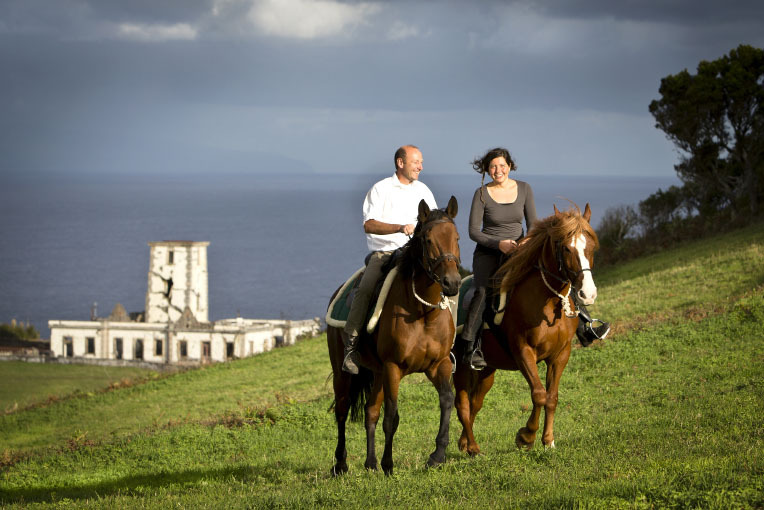 Along the coast and past ancient whale watching points we reach the highest place of Faial Island, Ribeira Funda. With the great view into deep valley, we habe our picnic. We continue our journey from north to west. We reach dense jungle. In the late afternoon we reach our lonely jungle camp. The horses remain the night there and we drive back to the Lodge where a nice dinner is waiting. Today’s trail leads us to the impressive and bizarre volcanic desert landscape of Capelinhos. This deserted landscape has already been the set of several science fiction movies. We pass ruins of old houses buried with ash from the volcano’s last eruption in 1957. The highly acclaimed underground Volcano Museum is located underneath the lighthouse, buried with debris from the eruption. We ride over volcanic ash and enjoy a break close to a small volcanic cave. A long canter around the green volcano “Cabeço Verde” takes us back to our horses’ paddock. The night ends with delectable food and drinks at our Lodge. 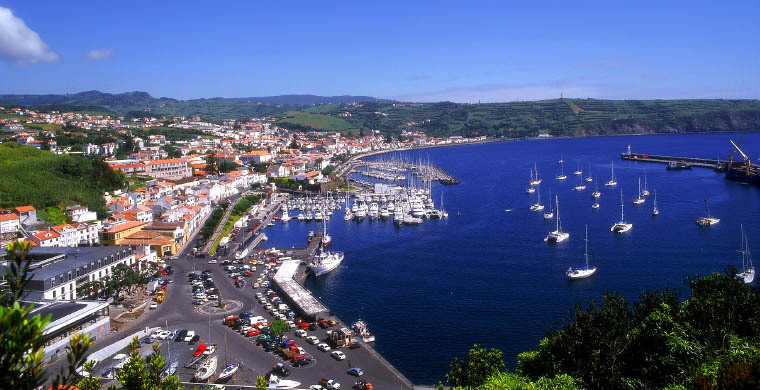 Today we drive to the picturesque island capital Horta. The discovery of the wonderful hiking trails around Monte de Guia is our first destination. Views into the sea volcano remembers you the power of volcanism. After a lunch break on the beach of Porto Pim we hike the old harbour town. The largest maritime picture Social Feeds in the world with its thousand pictures of sailors, dreamy shopping streets and century-old buildings with a lot of history. In the late afternoon, this day ends with a visit to the famous Peter Cafe Sport bar. Sharing a double room on request and only when available. If this option is not available, we charge a single room supplement. The holiday is also suitable for accompanying non riders. In this case, we charge the trail pric e is reduced by 357€ (i.e. without rider and only half board on riding days). All trail itineraries are general guidelines and in order to offer our guests the best-riding holiday experience we may change these. Depending on the number of trails running, the season, the weather and national holidays, we may make alterations to itineraries at short notice, which could affect the number of riding hours per day, the route we take to any given destination or the use of alternative accommodation. Trails can also be ridden in both directions. All changes are at our discretion but when changes are made, we endeavour to ensure that our high standards of quality are maintained and reflected in the alternatives we choose. Able to ride in all paces. Sufficient physical condition to hack for 4-5 hours. Maximum. riders weight 95 kg. We expect support from our guests in feeding the trail horses, saddle and tacking and cleaning the personal trail equipment. We suggest that you bring the following special equipment with you: waterproof trekking footwear, windproof and waterproof jacket and trousers, riding helmet. For Hiking: Day-Backpacker. Raincoats can be rent for 5€/day. 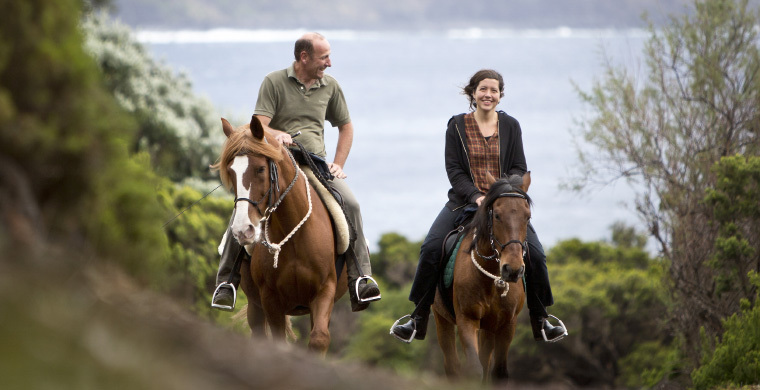 Riding equipment is free of charge up to 10kg with the Azores Airlines.